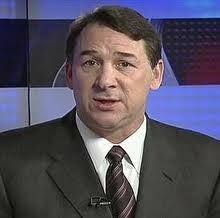 NBC NHL analyst Mike Milbury, a former coach and General Manager, created a firestorm in Pittsburgh yesterday, calling Sidney Crosby a “punk” and trying to be funny about Crosby’s concussion history. “Little goody two shoes (Crosby) goes into the corner and gives a shot to Schenn, ” Milbury said on Monday speaking to Sports Radio 94 WIP in Philadelphia. “Schenn was late to the party, he should have turned around and drilled him right away, but I guess better late than never,” Milbury said. So you know, Crosby gets cross-checked, big whoop. He said after he came back from his 35th concussion, I’m not going to do this anymore, I’m not going to get into this scrums, I’m going to stay away from that stuff. He couldn’t help himself because there’s a little punk in Crosby. He’s not the perfect gentleman. He’s not the sweet kid you see in interviews with his hat pulled down over his eyes.” I’d say screw him, hit him, ” Milbury said. After the comments have been met with such criticism, Milbury issued an apology today and no disciplinary action against him is expected from NBC. “I reached out to David Morehouse and the Penguins about the comments I made yesterday on Philadelphia radio. In hindsight, I realize what I said was inappropiate and wrong and I want to apologize to the Penguins organization and their fans, ” Milbury said in a released statement. Penguins GM Ray Shero is among those in Penguin management not amused by Milbury’s comments. “If it was an attempt at comedy, it falls real short,” Shero told ESPN.com today. “It’s fine to have an opinion on players but when you’re making light of concussions, that’s not right. I’ve gone through this with my own kid (who had a concussion), obviously we’ve gone through it as a team with Sidney Crosby and saw what it took for him to battle back from it over the past year, there’s nothing funny about post-concussion syndrome, ” Shero said. Sidney Crosby also responded to Milbury’s comments, following the Penguins morning skate today. Crosby’s comments were made before Milbury’s apology statement was released this afternoon. My Take on Milbury’s Comments: Milbury did his job from the standpoint that he has people still talking about it a day later and an argument can be made that Penguin fans are being a little too sensitive and most of his comments are something you just laugh off with this guy. However, where Milbury went overboard was the concussion comment and that took it to far.Â An apology had to be made because of that comment. Overall though, I don’t think he deserves to be fired and NBC appears to feel the same way. I also feel it’s ridiculous that some of the media is saying the Penguins shouldn’t do interviews with NBC until Milbury is out the door. That would be a little hypocritical for the Penguins considering they employ radio host Mark Madden on their 24/7 program who lets be honest says a lot worse and degradingÂ things about individuals, most notably women, than Milbury did with his comments about Crosby. Like Milbury, you just laugh them off.